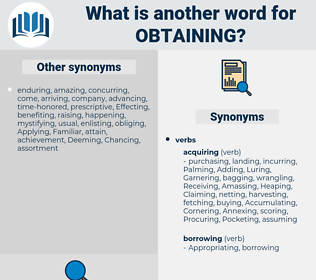 What is another word for Obtaining? Obtained, breeders, Securing, calls, Achieving, acquisitions. Securing, taking, assuring, derivation, derive, awarding. Generated, won, earned, registered, produced, sought, Provided, applied, recorded, wanted, required, Reached, Yielded, pursued, struck, Scored, pitched, Awarded. 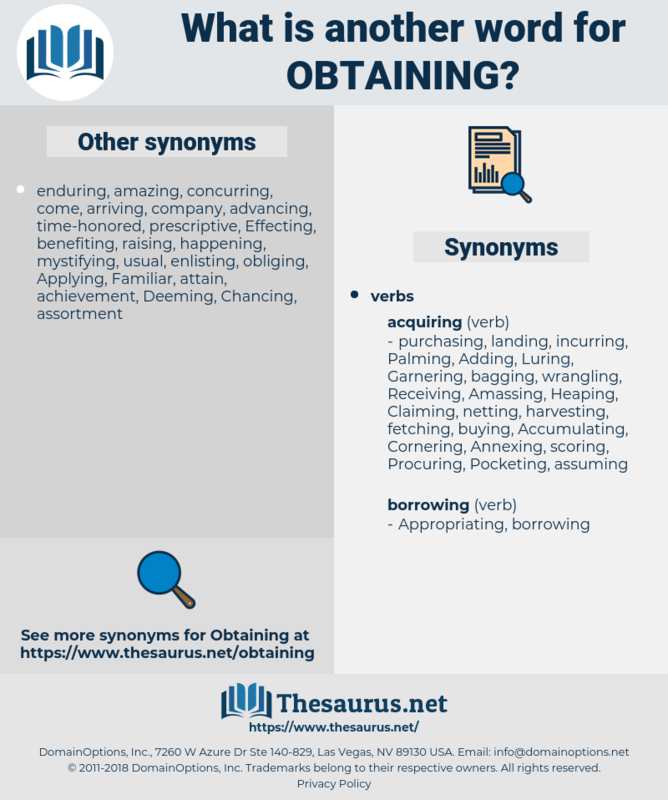 Ascertaining, Negotiating, applications, Guaranteeing, retaining, preparation, benefiting, implementing, Enjoying, transmitting, Establishing, Garnering, communicating, Submitting, Soliciting, enabling, demonstrating, existing, Introducing, arranging, Facilitating, Registering, Retrieving, enlisting, assigning, toekenning, absorbing, assembling, calculating, consent, deriving, qualifying, Accomplishing, allocating, Attracting, withdrawing, Adopting, Collating, Restoring, bring, bringing, Snatching, Removing, inviting, conducting, Organizing, recruit, Recruiting, maximizing, seeking, recovering, Possessing, financing, encouraging, Creating, Consisting, Aspirating, seizing, broadcasting, Estimating, ensuring, Mobilizing, Encountering, borrowing, Experiencing, combining, completing, issuing, compiling, Admitting, Applying, Extorting, provide, arriving, filing, Persuading, developing, protecting, Involving, improving, computing, approving, agents, Engendering, becoming, Dispensing, learning, L, searching, Enforcing, Reiterating, Managing, Reaping, conserving, coming, entering, safeguarding, preserving, Disposing, Insuring, contracting, fetching, Owning, holding, buying, counting, Swindling, Hiring, fighting, recording, mobilising, defining, striving, Claiming, Requiring, canvassing, shooting, mastering, performing, Booting, know, knowing, belonging, demanding, being, Harnessing, advancing, select, Selecting, Mustering, reaching, Preparing, challenging, yielding, drafting, concluding, tracking, Promoting, assuming, finishing, Arising, succeeding, Employing, Allowing, Displaying, catalysing, operating, realising, listening, Aiming, Occupying, drawing, moving, revealing, upholding, Sourcing, Presenting, agreeing, pursuing, sneaking, governing, convening, ending, prevailing, Comprising, Carrying, Choosing, grasping, supplying, Expecting, rallying, commanding, striking, Attempting, showing, Acceding, cheating, Charging, Defrauding, Fulfilling, reigning, scoring, resolving, fostering, resulting, opinion, using, Marshalling, matching, sending, bearing, pushing, urging, guiding, shall, mapping, facing, offering, passing, driving, Effecting, giving, dropping, setting, seeing, pressing, breaking, putting, Relating, trying, screening, paying, shaping, ordering, hearing, falling, calling, starting, Levying, leading, funding, rule, ruling, Having, going, gets, firing, meeting, raging, pulling, Doing, drinking, looking, hard, dealing, making, Capturing, calls, taking, awarding. Maintaining, Realizing, Graduating, Needing, Securing, assuring, Achieving. The case for the League was that it was the only means of obtaining justice for the Irish peasant. In addition to twenty - three of these species, they were fortunate in obtaining eleven new forms, some of them very remarkable.